Ronnie and Mary by the harbour steps in front of the legion. Behind Ronnie is a seagull engine. Ronnie was one of my mother's (Helen Watson) many Cromarty first cousins. 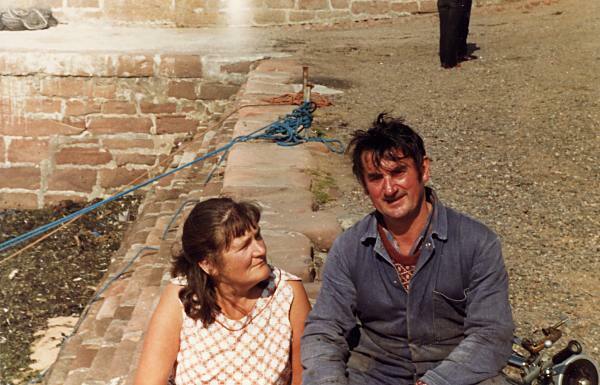 A great character Ronnie Hendry & wife Mary by the harbour wall Mary was Irish. Ronnie was a Merchant Seaman he had great Oneliners. I've been further aloft than you've been from home boys. From the lonely Sheiling in the glen. Though a vast ocean & Seas divide us. But our way is Highland & we in dreams behold the hebridies. was some of Ronnies oneliners when we met he sailed all over the world & loved Nova Scotia. Fondly remembered & sadly missed another son of Cromarty.